This vegan sun protection cream will not only protect skin from all kinds of weather, but also helps reduce redness! This is the perfect primer and sun protection in one. The texture of this is surprisingly light, while the balm is solid, it melts on contact into a silky serum texture. I use this every day as my moisturizer, after I have applied TRIPLE HYALURONIC + MISBEHAVING FACE SERUM. The texture of this is surprisingly light, while the balm is solid, it melts on contact into a silky serum texture. This was my very first Sun Cream, and remains my favorite. One jar, used daily for my face and neck, lasts me almost four months. ★Goes on slightly white, this is what protects you from the sun without chemicals. Make sure you get your eyes, lips, ears, and neck when applying. HOW DOES THIS COMPARE WITH OTHER BEAR'S BEAUTY PRODUCTS? WHICH IS RIGHT FOR ME? If you have pale - medium toned skin, this is perfect for you. If you want a primer for your mineral makeup, this is also a great option. If you are medium to olive skin, check out Medium Tinted Hemp Sunblock or Bronze + Block. You can also mix this with any facial oil or add mineral foundation to create a custom BB Balm. ☀ SPF is determined by expensive testing and depends on the freshness of the ingredients as well as the formulation. I can say, products with 14% Zinc are rated SPF 20. All mineral SPF should be reapplied every 2 hours or so when in direct sun. ❤Physical Sunscreens work by reflecting the sun’s rays, re-apply often or after swimming. ❤The beauty of this sunscreen is that is won’t harm you or marine life like Coral Reefs + Fish! ❤This is a thick enough balm that it will last you forever, but is light enough that it soaks in quickly and gives you a nice base for makeup or just a nice glow if you don't wear makeup. 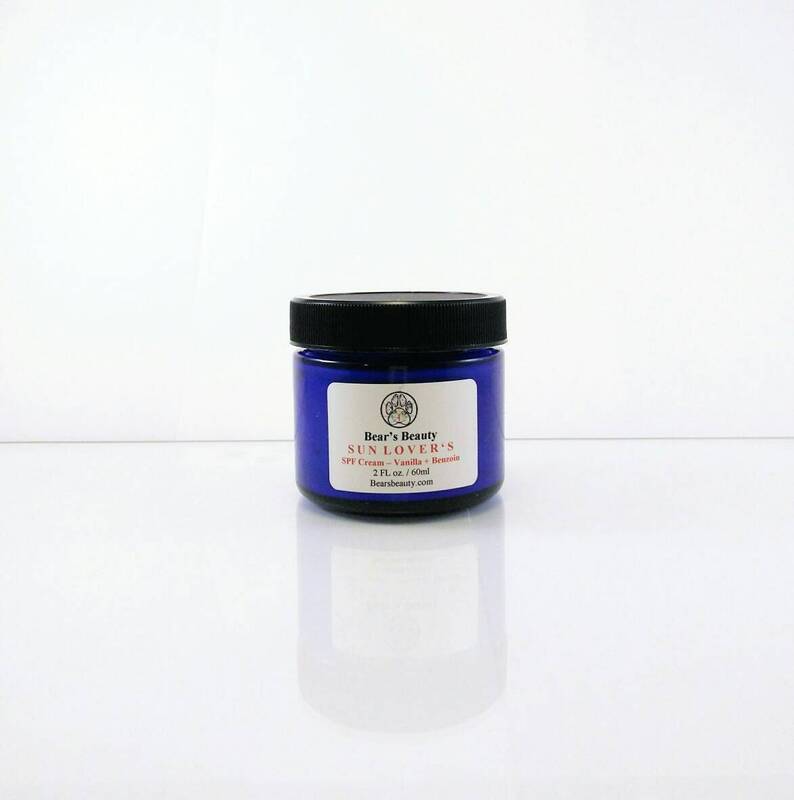 Shea Butter makes this cream thick and rich and protects skin from environmental stress without clogging pores! ❤If you have severe nut allergies, or already know that Shea Butter is not for you, please check out the Hemp Sun Cream. It is very comparable to this and made with Mango Butter instead of Shea. I often joke that I am not pale, I am clear. My Irish and German roots lend me a particularly pale complexion. I have struggled with protecting my skin from the Sun, while still seeking the benefits of the sun, since I was a child. The sun helps your body produce Vitamin D, a necessary vitamin in Calcium absorption. Besides that, sometimes you have activities that just involve you being out in the sun all day. I made this Sunblock Cream for my kindred spirits, clear people who refuse to be relegated to the shadows. LOL (did I mention I was a Theater Major.) In all seriousness, this Sunblock Cream is packed with ingredients known for having sun protecting properties. I love this because I can use it every day and it doesn't clog my pores or smell like coconuts. I wanted a Sun Cream that was strong enough for my pale self in full sun, but light enough that I would actually want to wear it. I do not have an SPF rating, mostly because testing is expensive and I am a small, but growing brand. Typical ratings for a sun block containing 14% Zinc Oxide are SPF 20. This cream contains 22% (almost double.) That does not mean it has an SPF of 50, but I can say from personal experience that it protects me for about 3-4 hours in direct sun. ★Organic Hemp Seed Oil moisturizes deeply while absorbing easily. It leaves skin supple + soft + and soothes any irritation + the green color helps to neutralize redness + ideal balance of Omega Fatty Acids helps to leave skin in better condition + helps reduce breakouts + won’t clog pores. ★Red Raspberry Seed Oil has natural SPF properties and is nourishing + antioxidant. ★Sea Buckthorn Oil is all around amazing and offers regenerative properties. ★Non Nano Zinc reflects the sun’s rays, acting as a physical sunblock. Reduces redness + irritation. ★Vitamin D helps to supplement the Vitamin D that your body would typically produce in the sun, since you miss out on that when wearing sunblock. If you are like me, I can only be in the sun for ten minutes without burning, so no sunblock is just not an option. For those of you curious about the range, instead of a concrete number; the freshness of the butters and oils has a lot to do with their SPF. Over time, the SPF properties degrade some. I want to be totally honest with my customers. This is not a Sunblock that you can purchase this summer, and use next year. This cream is made fresh, to order, with fresh ingredients. Once they are mixed together, you have a 6 month shelf life. 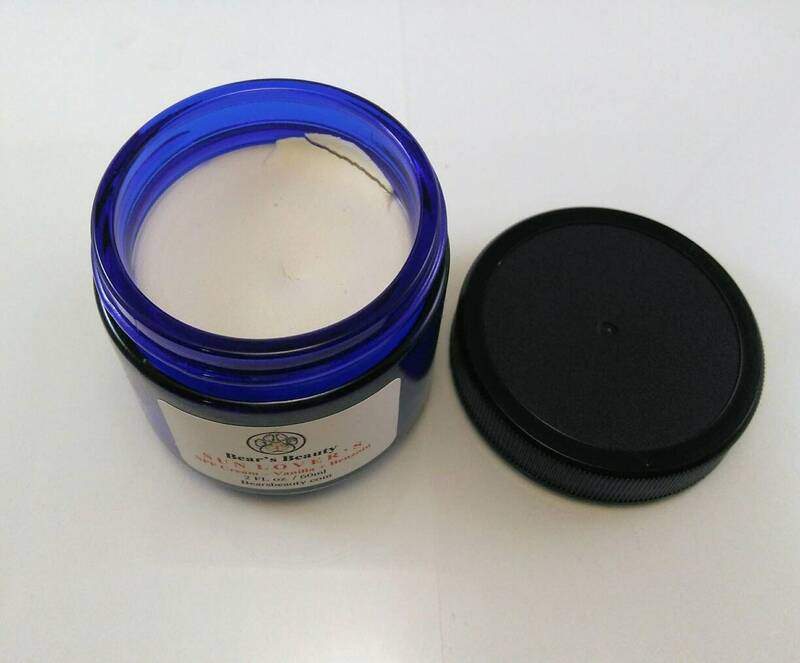 This is a semi-solid balm, either use your finger to dig into the surface and warm the balm between pads of fingers to spread OR gently warm the surface of the balm with the heat from your fingers and apply. Less is more. Apply before sun exposure and every few hours of constant exposure. For daily use, apply a thin layer and allow to soak in before applying makeup. Less is more, do not over-apply. If this arrives melted, place in the fridge for 30 min, then allow to reach room temperature, and stir with popsicle stick or something similar. She gave a sample with one of my orders and loved it! I use it on my face. Doesn't make me feel greasy/oily and doesn't clog up my pores. Very happy with this, even held up when I went swimming. Is a bit white, but that's a small price to pay, and I'll try the tinted one next! Very nice products. Worth the wait. Appreciate your note and the coupon. Products have a pleasing scent, which is a real bonus with natural products. Thanks! *External Use Only. Keep away from kiddos and pets. Discontinue use and consult your doctor if irritation occurs. Avoid Eye + Mucous Membrane contact. Consult a Physician if you are pregnant + nursing. All statements above are for information purposes, Bear’s Beauty does not make any medical claims. Products not intended to diagnose, cure, treat, or prevent any disease or ailment. The information provided by Bear’s Beauty has not been evaluated by the FDA. All products are intended for Cosmetic Use Only.